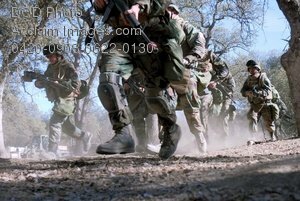 Description: Free, public domain image: Navy Seabees Running While on a Field Exercise. FORT HUNTER LIGGETT, Calif. (Dec. 6, 2007) Seabees attached to Naval Mobile Construction Battalion (NMCB) 3 spring into action after the alarm for an intruder was called. Seabees from NMCB 3 and NMCB 17 are conducting a three-week field exercise known as Operation Bearing Duel. U.S. Navy photo by Mass Communication Specialist 1st Class Carmichael Yepez (Released.